With over 900,000 copies sold worldwide, Exploring Strategy is the essential textbook for tomorrow's managers. From multinationals to entrepreneurial start-ups, charities to government agencies, this book raises the big questions about these organisations - how they grow, how they innovate and how they change. 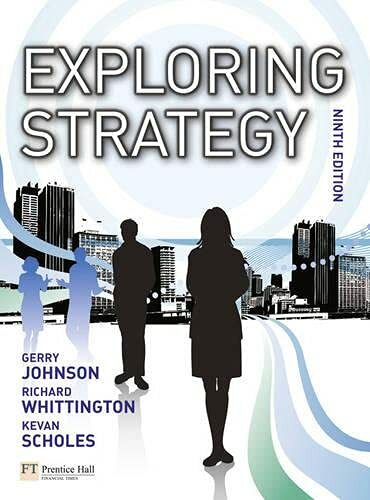 This ninth edition of Exploring Strategy will enable you to: - Understand clearly the key concepts and tools of strategic management- Explore hot topics, including acquisitions and alliances, internationalisation and corporate governance- Learn from contemporary debates and case studies on organisations such as Skype, Google, Madonna, Virgin and the Glastonbury Festival- Enhance your learning through specially developed online resources that will give you an extra edge in your course work MyStrategyLab has been developed to help you make the most of your studies in strategic management and get a better grade. Register now to: - Get hands-on experience of strategy analysis and decision-making with the Strategy Experience simulation- Learn strategy your way self-assessment questions will identify your strengths, with feedback and a recommended study plan to help you focus on where to improve- Revise for your exams using audio downloads, electronic flashcards and multi-lingual glossaries of key terms and definitions- Put a spotlight on strategy in the real world by watching video clips of managers talking about real strategic issues in their own organisations Register now at www.pearsoned.co.uk/mystrategylab by following the instructions on the access card enclosed with all new copies of this book! Exploring Strategy has sold a staggering 900,000 copies worldwide, thanks to its outstanding and engaging view of strategy in the world we live in. It equips readers with a detailed understanding of the issues and techniques of strategy, using illustration from real companies to make sense of the subject. With unique and powerful learning tools such as inspiring case studies, a new strategy simulation and video assignments, Exploring Strategy provides a proven high quality resource that you shouldn’t be without.